Wintersun – Faiths of Skyrim is an Elder Scrolls V mod launched last week. As suggested by its name, it’s all about introducing the ability for player characters to worship deities of the Elder Scrolls lore, who can pick from the Nine Divines and Daedric Princes but also among Elven Ancestors, deities worshipped by the Khajit and the Redguard and even minor deities. Owners of base Skyrim can download Wintersun – Faiths of Skyrim here, while owners of Skyrim Special Edition can go here. 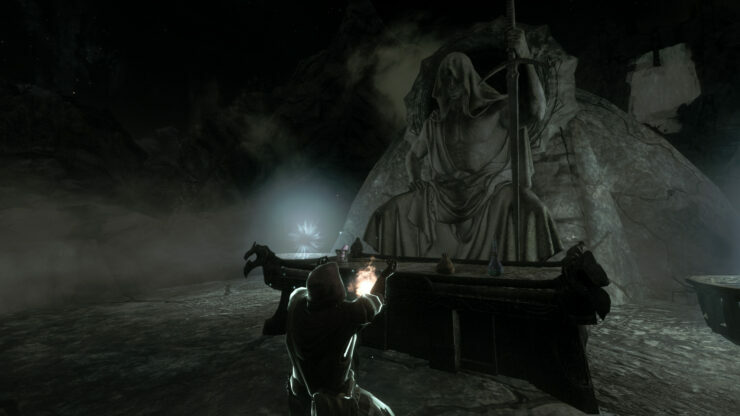 Wintersun – Faiths of Skyrim is also available for Xbox One, but not for PlayStation 4. When you use a shrine, you may choose to worship its deity. This makes you a Worshipper of that deity and you get a minor ability, the Meditation power, and a list of their religious tenets. Some deities can only be worshipped by specific races or after completing a quest. Adhering to their tenets and meditating or praying at their shrine will raise your favor with the deity. At 100%, you become a Devotee and gain a second ability that is a dramatic manifestation of the deity’s power on Tamriel. Ignoring your religious duties or violating their taboos will lower your favor with the deity, who will eventually leave you. You can only be a worshipper of one deity at a time. Use the Meditation power at any time to meditate, gaining some favor and revealing your current favor as a percentage. While you can meditate at any time and as often as you wish, meditating at least once a day is sufficient to raise your favor as fast as possible. Some deities restrict meditation to specific times or locations. You can also pray at the shrine of your deity. Prayer is equivalent to meditation, but grants additional favor. If using Survival Mode, praying comes with the usual gold cost. At the start of your playthrough (after the intro sequence or when you reach level 2), you may choose to worship one of several common deities for your race. This represents the religion your character adhered to before they arrived in Skyrim. While visiting a shrine is the most common way to become a worshipper, there are other ways. In particular, some Daedric Princes may reach out and offer you to become their worshipper when you commune with them during a quest or read about their deeds of might and glory, The Daedric Prince will only ask once, so choose wisely! You may find rare lost artifacts of holy or unholy power that improve your relationship with your deity. It will be interesting to see if this works with the upcoming Skyrim Together multiplayer mod.